Herman Melville said: “To produce a mighty book, you must choose a mighty theme.” In her young adult novel Steele Secrets, Andi Cumbo-Floyd takes on the mighty themes of slavery and racism. 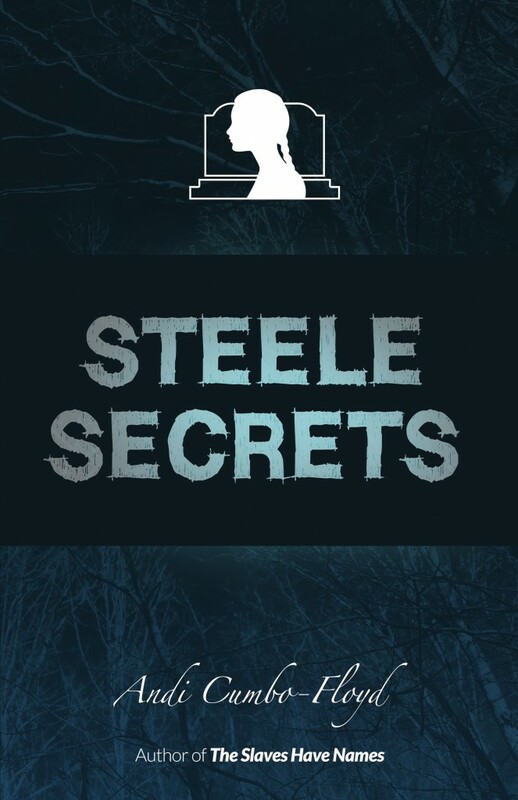 Steele Secrets tells the story of a 16-year-old girl named Mary Steele, who meets the ghost of a slave named Moses. As she gets to know Moses—and battles with her community to save this cemetery—Mary learns some secrets about her own past that make her question her own stories and the stories of her small town. Andi, this is your first young adult novel. What drew you to this genre and age group? What a good question, and I’m not sure I have a great answer. I typically write creative nonfiction for adults, so I’m well-versed in the tools of fiction—plot, character development, scene-work—but I’ve always found myself fascinated by what has actually happened. This time, though, I wanted to try to weave together a lot of stories—stories based on actual events I’d witnessed—and the best way to do that seemed to be through fiction. As for writing for young adults, I honestly think that came from Mary, the protagonist. From the get-go, I knew she was the center part of this story, and since she was a teenager, it seemed obvious that the book needed to be written with teenagers in mind. That said, I didn’t really set out to write a book for young adults, but in our culture, we label things—if it’s a book about women, it’s women’s literature. If it’s a book about African Americans, it’s African American literature. So a book about teenagers becomes young adult literature. I don’t know if I love that labeling, but I sure do love Mary Steele. What challenges did you face writing for teens? Well, it’s been a while since I was a teenager . . . a couple of years ago – so I did struggle with some of the pop culture stuff. For example, I don’t even know what Snapchat is. . . so I had to just own my strengths and make Mary a little out of step with her classmates. Hence the Johnny Depp and Veronica Mars references. Also, it’s hard to push away what I know now about slavery. One astute early reader pointed out that my voice shifts from being a teenage voice to being an adult one when I talk about what I didn’t know about slavery. That’s why I wrote the book in past tense, using Mary’s more mature voice to look back on this time in her life. Your book takes on the mighty themes of slavery and racism. Why did you pick those themes? I feel too grandiose saying that these themes are my calling, but they kind of are. My deepest passion is the recovery of the stories of enslaved people and my work to help heal the wounds rooted in slavery, i.e., racism. I am a southern woman, born and raised in North Carolina and Virginia, and I was raised on a slave plantation in Virginia from the age of 14. So the history of slavery is everywhere I go, and some of the places that are most dear to me were built by enslaved workers—the home that my dad still occupies and my farm now. But for the early years of my life, slavery was amorphous—written in numbers and as a small shadow cast behind the great nostalgia that is southern identity. It wasn’t until college—and then in my 20s when I worked for the Martin Luther King, Jr. Papers Project—that I realized that this was not history—i.e., something that lived only in the past. In those years, I learned what my education and southern culture had—through intention and apathy—left unsaid—that the legacy of slavery was long and very much alive. So now, I take as my work the effort to recover the stories of enslaved people because I believe if we look honestly at slavery, if we gazed into the eyes of people who lived under it and sometimes succumbed to it and often persevered through it, we can find healing as a country and as individuals. This book has a lot of details and information on slavery. What type of research did you do for the book? For the past five years, my research interest has been primarily the experience of enslavement in Virginia. In particular, I have dedicated myself to archival work to locate the names and as many facts as possible about the people who were enslaved at the plantation where I was raised and at other plantations in the area where I now live. I’ve also done a lot of genealogical research about these individuals and their families, so the genealogical aspect of this work comes from my experience of research—and from my own family’s story. I loved the setting for the book. Is the town a real town or based on a real town? Terra Linda is a fictional place, and I want that to be clear: I don’t know any towns in Virginia where the White Citizens Councils take this kind of action (although I’m sure many towns here do have active white supremacists groups). But I took the landscape and the geography for Terra Linda from the beautiful town of Buena Vista, Virginia, the place where my father-in-law was raised and my husband spent his childhood. In fact, the idea for the book came to me when we visited Neriah Baptist Church there in Buena Vista and my father-in-law told me about the time he saw a ghost in a graveyard near his childhood home. I was sad when the book ended because I wanted to spend more time with Mary Steele. Any thoughts on a sequel? A few people have asked me that, and honestly, I’m not sure. I, too, love Mary, so maybe she’ll have some more adventures of this nature sometime. We’ll see. . .
You’re a writer, editor, and farmer. How do you balance these different demands? You know, it’s actually really hard in some ways—mostly in terms of time and money—but it’s absolutely rewarding in every other way. Writing and farming are pretty symbiotic occupations because they both require, for me at least, a weddedness to a place and an openness of space. Editing—the way I help to pay our bills—is something that I am constantly adjusting in terms of balance because I often let it creep into my writing time. Also, because I read all day for work, I sometimes don’t read for pleasure, which can hinder my writing. So all that’s to say, it’s a constant struggle to get balance, and balance looks differently here on the farm in different seasons. When spring comes, my focus shifts to vegetable farming and less away from editing. . . but then I find that I write more in the summer, maybe because I’m not focusing so much on other people’s words. Still, despite the struggle, I wouldn’t trade a bit of this wordy, animal-filled life for anything in the world. Andi Cumbo-Floyd is a writer, editor, and farmer who lives at the edge of the Blue Ridge Mountains with her husband, 4 dogs, 4 cats, 6 goats, and 22 chickens. Her books are Steele Secrets, Writing Day In and Day Out, The Slaves Have Names, and God’s Whisper Manifesto. When she’s not gathering eggs or pulling weeds, she writes over at andilit.com, and she’d love to connect with you there. A free chapter of Steele Secrets as well as all the ordering options for the book are available at andilit.com/steele-secrets. Carollyne Hutter, www.HutterWriter.com, enjoys writing for children and adults. Often her work focuses on environmental, scientific, health, and international development issues.